Returning to the wondrous land of LEGO, we're checking out a medium sized set that offers a lot more than meets the eye. Containing 566 parts, this is actually three separate builds in one, and we've gone and built all three. We review the LEGO Creator Park Street Town House. 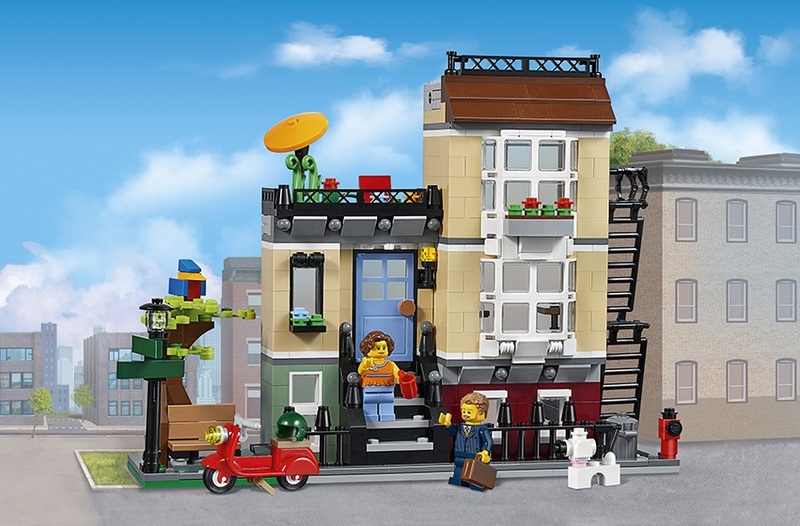 Using about two-thirds of the available bricks, the Suburban Home is a simple but detailed-packed little house on two levels with a greenhouse and front garden. Oh, first up, let's meet the minifigures, shall we? Included is a male/female couple with the guy sporting a suit, and the woman in an orange top with blue trousers that bleed into the body. Nice printing there, LEGO. There are no alternate faces under those hair pieces, but the printing does continue onto the back, making them very good 'City' minifigures, each with useful and detailed parts. Good. Right, back to the build. The front of the building looks great, with a small pond complete with ball-like fountain, and greenery in front of the greenhouse. The window next to the front door projects outwards, giving a nice sense of realism and depth. Unfortunately the Suburban Home is not a complete build, meaning the back side is exposed and wall-less. Still, you get a red swivel chair by the entrance way, and also a sink by the projecting window. There is no bed upstairs but rather a table and two chairs. We suppose the couple could just play poker all night, then. However, there is a very nice light above the table which can be angled thanks to the ball joint it is mounted on. Note also the flower box outside the window. Back downstairs and the whole greenhouse canopy can open, exposing more plants and a large sink and tap structure. There is plenty of floor space in here, and it works well next to the greenery of the garden. The canopy itself is a lovely build, using lots of different window pieces together. Oh, and there is also plenty of room on the roof to fit the figures, so they can gaze out over suburbia. Or spit on passers-by. Whatevs. The couple also enjoy transportation in the form of a moped, complete with a green visor-less helmet. It's a great addition to the set, and works with all three builds. So, the Suburban Home is the quickest of the three, utilising the least amount of parts. We like it, but we're not keen about the exposed rear side, preferring LEGO houses to be full 360. However, it took just an hour to build and looks great. Using most, but still not all, of the set's parts, we have here a single story cafe build complete with terrace and roof garden. We think the couple either run this place together, or the guy is supposed to be visiting it on his moped, while the woman works there. But whatever you want. Unlike the Suburban Home, the City Cafe can split open to reveal the interior... which is very small. There is just enough room in there for a coffee machine (which is excellently built), a plant, and three coat hooks. The outside eating area is designed perfectly, with plenty of room and a table with two seats. We love the trellis with greenery over the top, and the striped awning above the serving hatch. It's such a sweet little scene. There is more seating on the roof, as well as a small greenhouse that can open up to reveal the plants, and possibly vegetables, that grow within, There is a lamp, a detailed bench, and the greenhouse contains water taps. All good stuff. The City Cafe is a full 360 build, but the rear side clearly hasn't been designed to be looked at, with a mix of colours and lines. However, the moped parking area by the door is nice and adds depth and interest to the design. Because the build is on hinges, it can be swung right the way around... but it looks a bit weird and clearly wasn't designed to be viewed like this. But there you go, it can still do it. We'll be honest - it was a toss up between this and the main Town House build for what we built last and therefore kept on display. We love the overall design, the rooftop greenhouse, and the face-on 360 coverage. Using all 566 parts, and using them very well, is the final of the three builds, the Park Street Town House itself. Built with four levels of minifigure-scale architecture, we really love this thing, and not just for the looks, but also for the modular design. There is so much fantastic detail on the basement and ground floor - a level of detail you'd normally find reserved for the huge (and expensive) modular LEGO buildings. Note the ball parts embedded in the wall, the fire hydrant, and the bay windows. It's a similar story upstairs, with yet more fine detail beneath the roof garden, in the flower box, and around the front door. Split back open we can explore the internal details. In the basement level you get lots of windows, a fireplace, a sofa, and a wide-screen TV on a ball-joint. It's a nice space and when closed (if you peer through windows) there is quite a bit of room. Above that you get a fairly blank entrance way to the right, and a kitchen on the left. Inside the kitchen you'll find a small table, a counter over a cupboard, and a sink with tap over what looks like an over. Again, once closed up there is tonnes of space and light. ... as there is a window that leads to a fire escape. Look closely at the build of the fire escape and you'll see it doesn't make the best of logical sense, but it's a great approximation. ... which are amazing tiny builds in there own right. The poodle especially is great, and you can easily tell what it is, despite the small amount of parts used. Both are very LEGO Creator-y builds and they add a lot of visual value. As do the realistic street details like the lamppost, complete with street signs, and the trash can. There is also a pavement of sorts running around the house, meaning it could very comfortably fit in with other Creator structure builds to let you build your own city. In terms of display value, there is so much going on here that you're spoilt for play area and posing positions. This looks great on a shelf, and would add a lot to a street scene, or even on its own. And, as we promised on Twitter when the set arrived, we're blowing those gender stereotypes out of the water by having the woman return home from work in the suit, to be greeted by her stay-at-home husband with a cup of tea on stand-by for her. She's had a damn busy day. By far our favourite of the three possible builds, the Town House is a wonderfully designed structure with oodles of detail and texture. As a play thing it offers lots to do, and as a display piece for an older LEGO collector it's fantastic. 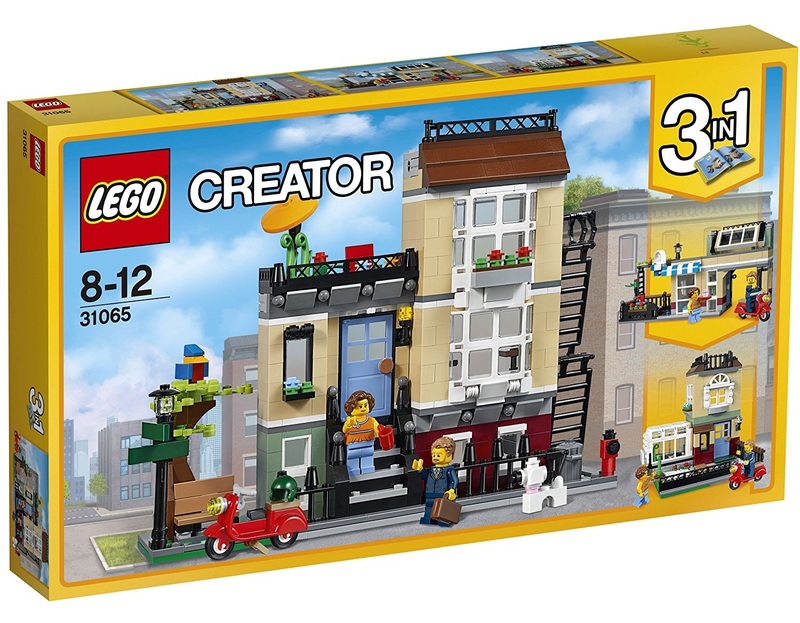 So the LEGO Creator Park Street Town House is very much worth it; both in terms of price-to-part ratio, and the number of actual, instruction-led builds you get. Kids could build all three over a few weeks, expanding the play time for each, or just pick their favourite and stick with that... until they get bored. However, the LEGO Creator Park Street Town House set is perfect for adult collectors too, as the level of realistic detail is good, and the included parts are very handy if you're looking to make your own LEGO buildings and structures.